50 cc rental scooters give a good opportunity to enjoy European cities in a stylish way. Affordable and practical, 50 cc scooters are powered by economical motors. Their wheels are middle size - usually 30 cm, which offers more precise handling. They feature comfortable leather seats and some of them even spacious helmet case. Made with advanced technology, 50 cc mopeds offer robust construction and reliable disc brakes. Their engines and fuel tanks are located under the rider's seat and at the rear which provides enough footrest. This class is suitable for short distance trips in contemporary city traffic, however 50 cc mopeds are not recommended for highway use. Best models are S 50 2T, S50 4T 4V, LX 50 2T FL, LX 50 4T 4V FL from Vespa, Peugeot 50cc V-click, Yamaha BwS 50cc, Honda Ruckus, Honda Metropolitan 50cc, Piaggio Typhoon 50 cc, Liberty 50, Fly 50 4V, SR 50 R, SR 50R-Replica, SR Motard 50 and SR 50 R Factory from Aprilia. 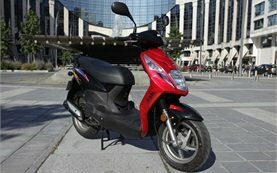 250 cc scooters offer an elegant and competitive way to get around European cities. Their performance, power and easy usage provide riding pleasure and enjoyment on the road. Sporty and aggressive, 250cc mopeds are inspired by the racing world. 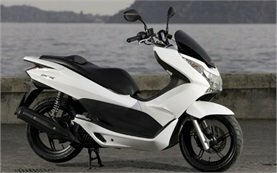 They feature powerful 250cc, electronic injected engines, large scooter suspension, smooth fairings and grippy wide tires. Seats are ergonomic and comfortable, some of them even with back support for the rider. 250cc scooters offer under-seat carrier rack or rear rack and windshields for better protection. Interesting model is Piaggio MP3 250 - the first one with two front wheels. Excellent examples in this class include Aprilia Atlantic 250, Aprilia Scarabeo 250, Aprilia Sportcity 250, Piaggio MP3 250, Vespa GTS 250, Vespa GTV 250 and Honda Elite 250. 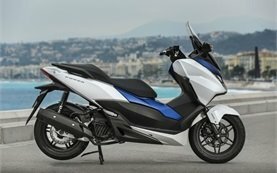 Implementing the best aesthetic standards in their sporty design, scooters over 400cc apply the most advanced technologies and high quality components. They provide outstanding performance equally well around town as on the highway. 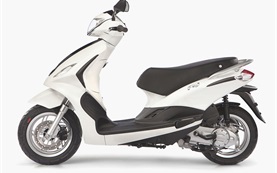 Mopeds over 400cc feature powerful, high accelerating engines, advanced brake systems and reliable suspension. Easy handling and extraordinary safety make them preferable transportation means even for new riders. Their engineering performance ensures optimal fuel economy and emissions control. Wide, smooth seat and spacious carrier case add more comfort for the rider. Best examples in this class are Aprilia Scarabeo 500, Aprilia Atlantic 500, Piaggio MP3 400, Piaggio MP3 500, Piaggio BV500, Yamaha Majesty 400 and the extraordinary Suzuki Burgman 650 Executive. Urban scooters accomplish the optimal balance between extraordinary sport design and excellent performance. They feature tubular steel frames, an electric starter, light alloy wheels and economical engines. Easy handling, fuel efficiency and advanced emissions control make them preferred transportation means in the busy city traffic. With reliable disc and suspension systems urban scooters ensure safety and stability under all conditions. 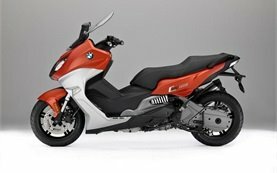 Best examples include Aprilia Sportcity 50, Aprilia Sportcity 50, Aprilia SR 50 Street, Aprilia Scarabeo 50, Yamaha BW 50, Vespa LX 50 4V and Vespa S 50 4V. 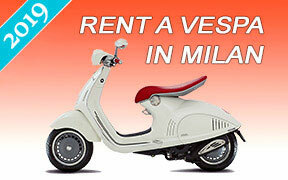 Urban rental mopeds offer a great way to explore European cities or resorts at first-hand. It is clean, fun, cheap transportation; plain and simple. Born in Italy after the World War II, classic scooters were originally introduced as a cheap transportation. Today, contemporary scooters are widespread valued vehicle. 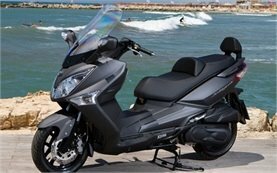 It is understandable why Italian manufacturers such as Vespa, Aprilia and Piaggio are the biggest and most popular scooter producers, but Japanese companies Yamaha and Suzuki are worthy rivals as well. First scooters - the Vespa models are based on the revolutionary Vespa technology, implementing the advanced tooling of Piaggio. Nowadays, classic scooters are the result of the struggle of the best engineers to ensure the highest standards and emissions control. Classic mopeds incorporate comfort, safety, style and elegance. They feature powerful engines, reliable brakes, exclusive suspension, sleek fairings and tubular steel frames. Additional comfort is provided through adjustable backrest and spacious carrier case. Models such as Aprilia SR 50 Street, Aprilia SR Max 125, Aprilia Atlantic 300, Aprilia SRV 850, Vespa GT 150, Vespa ET 4 125, Piaggio Fly 150, Piaggio BV 350, Piaggio MP3 500 and Yamaha BV 50 have become legendary in the world of scooters. The 3-Wheel category revolutionazed the world of scooters which have been a popular choice for personal transport in Europe since the World War II. Motor scooters have been a popular form of urban transportation because of their easy parking and storage, traffic issues in crowded cities and the convenient driving position. 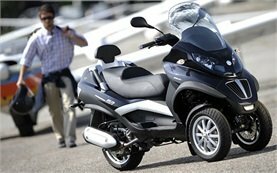 Since its first launch in 2006, the revolutionary three-wheeled scooter from Italian manufacturer Piaggio has been acclaimed for its combination of two front wheels and a single rear wheel. Practical and affordable means of transportation, the Piaggio Mp3 has become the preferred hire scooter choice because of its safety, road grip and stability unattainable with a two-wheeled vehicle. The use of three wheels, two of which at the front, was a revolutionary technical intuition that has led to a truly unique scooter and has redefined the very concept of what the modern scooter for hire is. Known as touring scooters as well, Maxi 2 Up scooters can accommodate 2 passengers and provide great performance around town or out on the highway. 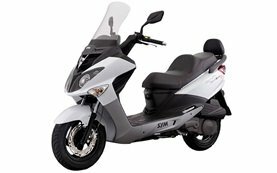 They feature powerful engines between 250cc and 650cc, larger heavier construction and the same step-through design common to all scooters. Easy handling, smooth, responsive suspension and reliable brake system are some of their characteristics. Comfortable wide seats allow you and your passenger to enjoy the ride hour after hour. Most of the two-up mopeds have under-seat storage case which can take two helmets and additional front cases for small items, and other amenities added for both rider and passenger. Best Maxi 2-up examples include Piaggio BV Tourer 500, Piaggio BV Tourer 250, Honda SH 150i, Honda Elite, Vespa GTS 300, Vespa GTV 250, Aprilia Scarabeo 500, Yamaha Zuma, Suzuki Burgman 650 Executive, Yamaha T-Max 500, Honda Silver Wing and BMW C 600 Sport. Maxi 2Up rental mopeds are an excellent choice for cruising and long journeys throughout Bulgaria.